Perhaps one of the most important aspects of diamond grading is the Carat weight. The larger a diamond, the bigger its carat yet even the smallest diamonds are able to capture the eye if they are set into exquisite jewellery. The way a diamond is set can even effect its size (if by appearance only). Carat is the standard unit of weight used for gemstones. 1 carat = 0.2 grams, or 200 milligrams. The higher the carat, the more rare and more valuable the diamond. Just as currency is divided into smaller units, a carat is divided into 100 points. For example, half of a carat will weigh 0.50 carat (ct). A quarter of a carat will weigh 0.25 carats (ct), and so on. Does size matter? Large diamonds are rarely found in nature so they are more valuable than smaller diamonds of the same colour and clarity. This means that the price of a diamond will increase exponentially as the carat size of the diamond increases. Diamonds of one carat or larger are so rare that they represent only 1% of all the diamonds mined worldwide. Many of the world’s largest diamonds were found in South Africa. “South Africa has produced some of the world’s largest, most valuable and memorable diamonds and today maintains its position as a top diamond producer,” says Yair Shimansky, Founder and CEO. CAN SHIMANSKY ANSWER THE QUESTION ON EVERY WOMEN'S MIND? However, big does not necessarily equal better. While the size of a diamond has the greatest influence on the price, the cut, colour and clarity will affect a diamond’s brilliance and beauty. A diamond with a large carat weight, but with a low colour, cut and clarity grading could, for example, be more less valuable than a diamond of lower carat weight, but with exceptional colour and clarity. Similarly, two diamonds of equal carat weight could vary significantly in price if one were to have a higher cut, clarity or colour grading. Though the carat weight of a diamond gives an indication of its size, weight and size should not be confused with one another: The size of a diamond is also dependent on its cut and shape. It is quite possible for two diamonds of the same carat weight to appear to be different sizes. Each individual diamond’s proportions (such as the table and depth percentages) must be taken into account to determine its size. A shallow diamond with a wide table may appear larger than a diamond with a deeper cut, and a narrower table, yet they may have an equal carat weight. An elongated shape such as a Marquise tends to maximise carat weight, as it makes the stone appear larger than that of a traditional round shape of a diamond of equal weight. The term carat originates from the seed of the carob tree. In ancient times, before scales and units of mass were invented, diamond traders compared the weight of a diamond to the seeds of the carob tree. Each carob seed had a uniform weight, equal to 0.20 grams or 200 milligrams and hence determined the weight of the diamond. The carat metric was officially adopted by the United States in 1913, with other nations soon following suit. Today, the carat is a universal metric measure, with all nations adhering to the exact same measurement. That means that when you purchase a diamond, it will have the same carat weight everywhere in the world. Shimansky offers a wide variety of diamond sizes to meet all your jewellery creation needs: From larger diamonds weighing over a carat, to the smallest of diamonds found in a micro setting, and everything in between. 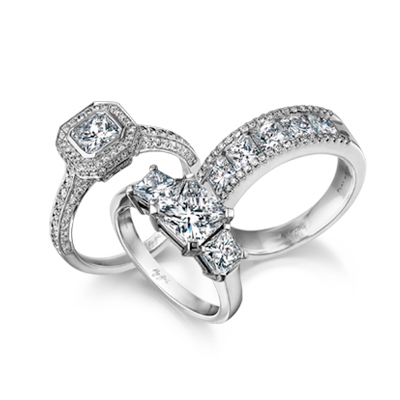 Shimansky diamonds are cut to maximise their beauty and their brilliance – not to emphasize their size. That means that all Shimansky diamonds, regardless of their size, are cut and polished with the same passion and attention to detail. Whatever the size of the diamond that captures your heart, you can rest assured that it was cut and polished with the utmost of care, and that it displays the maximum amount of fire, brilliance and scintillation. When selecting a diamond size for an engagement ring, it is important to take the wearer’s ring finger into consideration. A long, slender ring finger will make a diamond appear larger, while a shorter finger could make it appear smaller. Similarly, the diamond’s setting can also have an impact on the appearance of the diamond’s size. A delicate setting tends to enhance a diamond’s size and prominence, while a bulkier setting could make the diamond appear smaller. Whilst it is important to take these factors into consideration when selecting a diamond size, one must remember that they only have an effect on the appearance of the size of the diamond; they do not alter the carat weight in any way. The carat weight of a certified diamond is recorded on its accompanying certificate from the GIA, EGL or SGL (proving its authenticity). Remember to ask the store assistant for the diamond certificate when viewing a diamond.